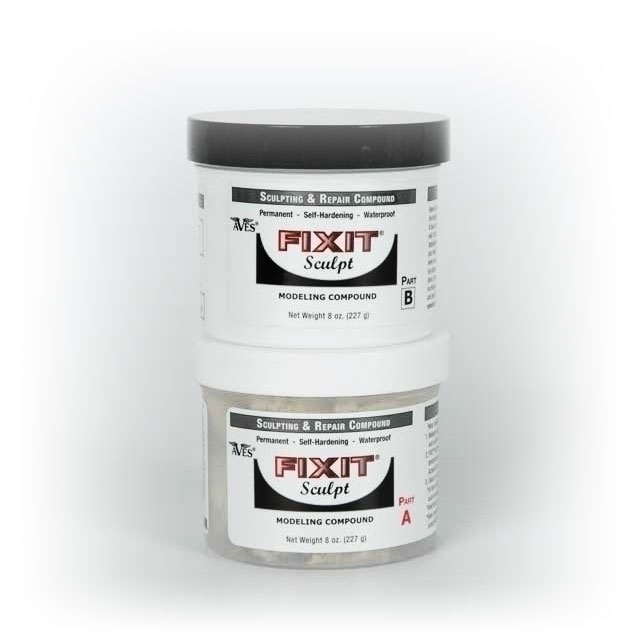 FIXIT® Sculpt is an extremely versatile product that combines the features and benefits of modeling clay with the industrial strength & adhesive power of epoxy! Its clay like feel resists sagging and drooping; holds small details & impressions extremely well. Its firm/fine grain texture backed with fiber technology is great for many uses ranging from detailed & intricate sculpting to a multitude of repairs. Generous 4 hour working time allows you to achieve your finest details. Adheres to: Itself (in any stage of set up before or after curing), other epoxies, Polymers, Ceramic, Stone, Plastic, Fiberglass, Wood, Bone, Metals, & more! FIXIT® Sculpt is ready to use; working time is 3-4 hours. Shape as desired. Smooth or texture with a wet finger, brush, Q-tip or sculpting tool. Self-hardens (NO BAKING); 24 hour full cure to a rock hard, flat finish. *Wear protective gloves [e.g., nitrile or equivalent] when combining parts A and B. Wear a dust mask and safety glasses when sanding cured product…[P280] *Keep out of reach of children…[P102] *Safe for adults when used as directed. 24 hr. full cure required for hard finishing purposes such as sanding, carving, drilling, machining, etc. Keep containers sealed when not in use. Freeze-Thaw-Stable. Great for those that need extra working time for intricate sculpting work. Excellent for Antler & bone art, or ceramic repairs…more!